Stimulant Positive Energy! Increases Focus & Rapid Fat Burns! Imagine your body as an Incinerator of fuels and a Fatcinerator of the garbage and toxins you consume. Thermogen Heat works this same way from inside your body! Think about it, you fuel your body via the 5 food groups. Sometimes you indulge yourself with bad foods (garbage), sugars, fats or toxins. But... as your body is burning on ThermoGen Heat; Here it can act as a FATCINERATOR… it burns fuel, burns garbage; it burns and incinerates everything you put into it. 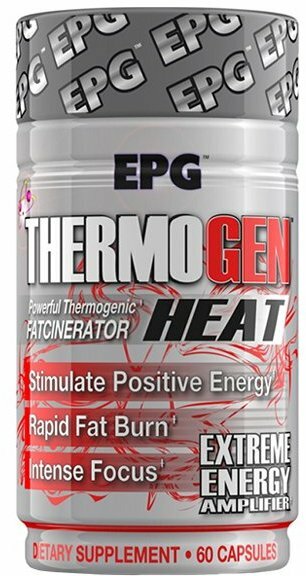 Upon taking (1 capsule taken) ThermoGen HEAT in just 15 minutes. You`ll feel the chills of the Alpha Yohimbe that tingles the hairs on your arms and head, signaling the burn is about to get started. The caffeine (not too much) picks up your energy levels in about 30 minutes. Then, the Synepherine HCL takes over. This is the real driving force; you’ll feel the sweat on your forehead and all over your body. Your need to drink lots of water becomes evident with your thirst to replenish your body that hasn't even worked out yet. Most users will take this Extreme Energy Amplifier and utilize it`s intense focus. Toward some mental or physical activity that by taking ThermoGen Heat…. Becomes enjoyable and FUN… This defines Stimulate Positive Energy!